But name one real-life celebrity who has her own breast cancer awareness website. There isn't one. Matt and Trey would be the ones to ask about a real-life inspiration for Freya, but if they made her up, you have nowhere else to go and no one left to ask. Making fun of women with breast cancer is not cool and so Matt and Trey would be in hot water for bullying a celebrity survivor of breast cancer. They would receive further backlash for having this character commit suicide. I don't think people will be coming out to say there is this person that Trey and Matt hate that they based Freja Ollegard off. It would be too malice. I think they just wanted to show off Gerald doing something really sexist and reverse racism like. There is Randy, Gerald and Kenny’s dad and then two other guys in the picture. Weird that the dads will be witches, feels so gay and trans. I like that its witches as I grew up in New England which has that appeal. It only takes one bad witch to ruin it for all witches in an all-new episode titled “SONS A WITCHES” on Wednesday, October 25 at 10:00 p.m. ET/PT on Comedy Central. This year at the traditional Halloween get together, a witch casts a spell that terrorizes the town and ruins Halloween for the boys. Cartman sees a way to use the witch’s power to his advantage. There is a box Randy is holding, all I can make out are ending letters of maybe “ELS”. Is it a bagel box? Looks like molotov cokctails or some alcohol they were to drink or the sky in the background makes me think of binoculars. Wonder why men would become witches? Not sure what kind of spell, usually it’s a binding spell, like 9 out of 10 times it’s a binding spell. Somehow Cartman finds a way to take advantage, maybe people are not allowed to do things after the binding spell so he now can steal or make a gain of some kind? Could be Cartman after free unhanded out candy. It's about time we get another Halloween episode. All the witches are men? wrote: There is Randy, Gerald and Kenny’s dad and then two other guys in the picture. I am utterly shocked to see Stephen Stotch excluded. I'm hardly complaining, as he's one of my least favorite characters, but these days he has almost as many lines as Randy and Gerald. It's welcome to see Stuart get a line again - this is his first in a couple of years, I think? Gerald making his first appearance this season as well. Parent/Teacher Conferences? 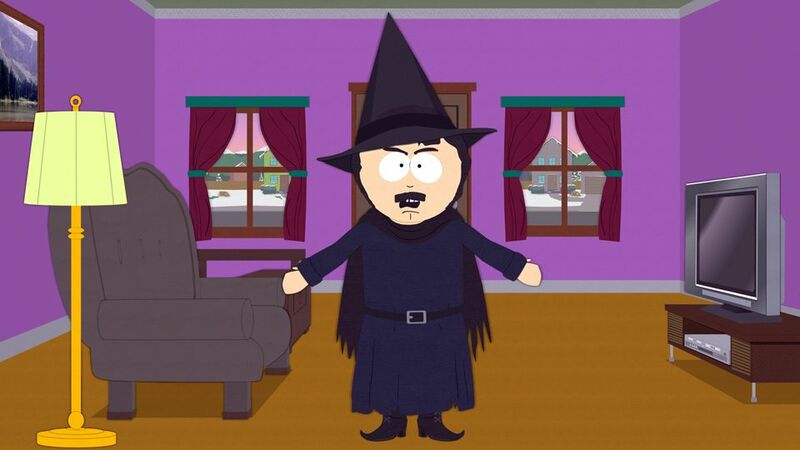 Maybe Cartman wants to use the witch's abilities to prevent that somehow. I recall during my time in school there was a student who created a fake bomb threat to prevent a parent/teacher conference (yes, really) because he was embarassed about his grades. Looks like we have to wait until Wednesday to find out who the witch is, but I'm excited. 'Sons a Witches' makes me wonder if it's someone's mother, but it's probably just a title pun. Wonder why the dads are dressed as witches. lol Also wonder who this 'real witch' is that casts a spell and what exactly that spell does that ruins Halloween for the boys. Really liking how so far none of the episodes follow the same story and plots from previous episodes. There's almost a sense of normalcy this season. And this episode sounds like a fun and simple Halloween story so I am looking forward to Wed.
Looks like a fun episode, although I doubt it's an actual witch who casts a real spell. No, Cartman probably wants to use those witches' affect on Halloween, not PTC. And I'm guessing that Heidi Turner will play a part in this somehow as well. May we get some additional screenshots of the upcoming episode for this week please so we can get a few more ideas of what to expect from this episode like maybe scenes of Cartman? Last edited by SouthAl93 on Mon Oct 23, 2017 5:57 pm, edited 1 time in total. The dads dressed as witches have a box of Jack Daniels whiskey. It makes me think a huge fire will start by accident and it was some drunken witches at fault, probably Randy's.